It’s like déjà vu, all over again. Another year, another ridiculous amount of money spent on little plastic bricks and the biggest toy sellng season is officially in full swing. When the Star Wars Advent Calendar came out last year, well, it earned a lot of hate. It seemed to linger on shelves (not here, it sold quite well and cleared out quickly) and I believe is even still available in some places at discounted prices from time to time. It was a farce! An insult to the fans and the children it was aimed at alike! It was obviously a complete and total failure on every conceivable level and a perfect message to LEGO that they were sure to hear loud and clear and never, EVER would they make the same mistake again! 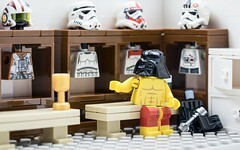 Well, they got the message and the answer is… The LEGO Star Wars Advent Calendar 2012 edition! Yay! It’s back Baby, and so am I to spam your December with a micro review for each and every day. I’m so very, very sorry. Let the fun begin! The verdict in the end last year was buy, but it was the end of the road and if you didn’t have it already you weren’t heading out on Christmas eve to try and track one down on sale so you could put such a thoughtful and timely gift as an advent calendar under the tree. Switching it up, I’ll suggest you buy it now. It’s on for half price on LEGO [email protected], so pick it up today and you could still end up counting down the last two weeks with the rest of us. See they’re learning already. Last year they started with an osbscure vehicle that was only in a couple of scenes from the least popular of the films and this time, oh wait they did the same thing. It’s a tight little model and some features are cramped while others are exaggerated, but regardless of that I’d have to say this is my favourite LEGO model of this sub. I’d have loved it if they could find a way to split the tail up (perhaps one of these, or one of these, with an elastic around the ends, in blue or bley), but I’ll take it this way. I was impressed at the use of the fender piece to convey the swooped wings/fins and I can think of worse ways to start off this countdown. Who knows, it could be all uphill from here. Seems LEGO did learn something. Last year the figure was Nute Gunray and this year they kept it a bit more generic with a simple Gungan Soldier. 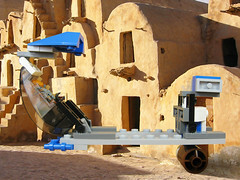 You can decide for yourself if that’s a good thing or a bad thing, but at least it’s not Jar Jar and if you do have a thing for army building here’s another one for the battle of Naboo. 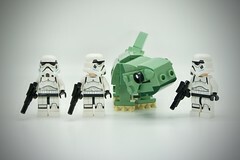 Did somebody complain to LEGO that the problem with last years calendar was “not enough Gungans”? It’s Ok. We’re all friends here, you can tell me. It’ll be fine. Three days in and we get a weapon rack. I think I liked the walking chair better, but at least the Gungan gets his nifty shield/sled. This is really where the advent calendars value bugs me. 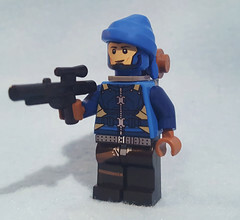 If you put the one or two accessories that each fig needs in with it (like they already do with the exclusive figs) you would only need to add 2-3 extra models to fill out the days where they stick the weapon caches. Those three extra models would require maybe 50 parts on the outside which would still be well under 300 pieces for a set that costs $40-50. So what’s driving up the price? Desirability? The cost of the tray inside (which is awesome for sorting)? At least this weapon stand is a weapon itself, but they lose points right off by only including one of those blue energy ball things. The city set last year came with three white ones for snow balls. Not cool LEGO. I want more blue balls. Tiny Star Destroyer is tiny. If you need to strike fear into the hearts of say, dust mites or flu germs, this might be the ship for you. I only have one issue with this little guy and it’s the nose, but I don’t really know what they could have used to bring it to a sharper point. All LEGO ISDs are just wedges and plates on top of wedges and plates on top of wedges and plates anyway. This time it’s just a lot quicker. You know, the dust mites may even think this is cute. It looks like we might have a contender for the worst micro of the year! It’s got a higher piece count than last years TIE, but it’s still pretty pitiful. The gap underneath is to big, the sides are too straight and blocky, but the real kicker is the fact that the front showcases the bottom of the stud. It’s like the droid dispenser is always open for business and it bugged me so much, I’ve sent him off to sit in the corner with 2011’s TIE Fighter. I hate it when they look better going then coming. Go on now MTT! Shoo, get to the corner! Bad MTT! Awww, what makes you think that? That’s not true, lots of great things came out of those movies. Last year had a couple of stand out models that not only looked good but were functional as well. The first and hopefully not last model in that catagory for this year is the micro Vulture Droid starfighter. It has a low parts count, but that just makes it even more impressive. The simple function to give it it’s walking ability was so clever, I found myself playing with it quite contently for a few moments before I even noticed it was built with some parts I wish I had way more of. Where’s that Naboo Starfighter, let that dogfight begin! Grand Moff Tarkin was a force to be reckoned with. He was as ruthless and efficient as he was despised by his enemies, but beyond him the officers of the Galactic Empire seemed like nothing more than puppets or Vader’s choke buddies to me. I’m starting to think that all they needed to do to appear more menacing was for them to wear their battle armour all the time, or at least some sunglasses. Look at how intense this guy is. He’s like Elwood Blues, the T-800 and Elton John all rolled up into one (admittedly less fabulous) package. On second thought, scratch Sir Elton off that list. Let’s replace him with Horatio Caine, he has the same sunglassy eyed stare and all the personality of a small plastic toy. Seriously, it’s calling for 10cm here. Woke up to snow, school cancellations and this adorable little guy just waiting to be put together. I’m always down with a visit to Hoth, regardless of how much I dislike snow, so I can only hope this trend will continue. Could this model have been improved by using two 2×3 bley plates with a 1×2 in the middle under the tile and a double cheese slope on either side? Yes, yes it could, but I’m giving it a pass because I’m still impressed with the idea and I love the bley telescope legs. Plus, the all firepower/no brain head design is very amusing to me. What can I say about this thing? It looks like something Dr. Evil would use to mow his lawn. A quick trip to Bricklink reveals they call it a Hoth Blaster Station, either way it just brings the line “Aren’t you a little short for a…” to mind. Well, I asked for more Hoth. Let’s move on with a sense of optimism, shall we? Here we are half way through our countdown and yesterday’s snow blower/laser blaster seems a little less lame now that it has someone to push it. This was my favourite guy from 8083 Rebel Trooper Battle Pack, though I’ll bet Bricklink considers this a unique figure due to the mixing of head a torso from two different figs in that set. That face always struck me as a no nonsense, tough as nails soldier and would make a decent Thaddeus “Thunderbolt” Ross. I figure he must be the rebel equivalent of Obi-wan Kenobi and he loses his goggles so often they gave him three pairs. Big improvement over yesterday, must be the ‘stache. As a kid I always thought these were walking refrigerators. Looking back now, I’m surprised I put any thought into them at all. As far as brick-build characters go, he’s head and shoulders above the mouse droid. Now that our trooper has some portable power he can plug in and finish snow blowing the secret base. GNK makes a pow-pow-powerful droid! That’s better. Not fantastic, but better. Sticking with generic army building figures and the winter wonderland of Hoth, we now have a Snowtrooper. I don’t buy multiples of many sets, so I was pleased to get another of these snow flakes. Getting even more short on weapons though, hope that doesn’t mean we have another depot on the way. I guess that’s enough of a trip to Hoth for one calendar, it’s time top get back to TPM! This falls into the “OIC” catagory for not being as instantly recognizable as some of the micros and it’s also a straight-up fail imo. The super sleek shape of the ship would be difficult to pull off at any scale and here, it’s pitiful. 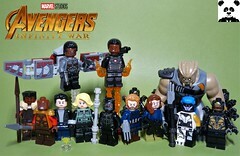 The majority of the bley bits on this have been produced in metallic silver so this would have been LEGO’s one shot at giving up a shiny Nubian, as I believe the assumption at this point is that they haven’t because they don’t want to produce all the shiny and figure we’ll revolt if they make it in bley. Let me tell you, it’s the reason I own a pitchfork. Much better. Here’s a model that not only works well in the micro scale, but they even managed to incorporate a nifty little build into it as well. It looks good on its own, pretty much nails the vehicle at this difficult scale and it’s green. I always like a little colour in the predominantly bland Star Wars palette. I have less issue with them focusing on the prequels as I do with them making the wrong vehicular choices. Today is a win in my book and I look forward to whatever fig they’ve got in store for us (if their pattern holds true) tomorrow. I don’t really know where this guy fits in so far, so I guess we’ll be seeing an OT micro tomorrow to go with him. If not, we could certainly have been stuck with worse figs that could’ve been shoe-horned in. Oh wait, he’s probably one of the generic troopers strewn about when Vader boarded the Tantive IV after it was capture by the Star Destroyer! Connection made. End transmission. This little Neimoidian shuttle is cute and recognizable, but really should have been in last years with Nute Gunray. It’s a nice little tan assortment that makes me wish I had about twenty of these for the parts alone. It doesn’t have the transparent cheese slope cockpit they use for practically every other micro (even foolishly on the Nubian), so this must be an automated version. Too bad they didn’t cap it off with a tan level as well, I could use more of those. I don’t know why, but I’ve always liked this prequel ship and this micro captures it very well in a soullessly charicaturish sort of way. It’s difficult to focus on reviewing this little guy, what with the awesome announcement of a Back to the Future set this morning and the impending doom that awaits us at the stroke of midnight tonight (PST obviously). I’m going to assume that since LEGO now has a time machine, they’ve already seen that everything’s going to be ok and that’s why they couldn’t wait to tell us the good news. Since the other option is that they know the world is going to end anyway, so they can make this announcement and by the time Universal has their legal team mobilized it’ll be to late, I’m choosing optimism/sanity. If this is the end (and it’s not… hopefully), I’d just like to say that while I thought Nolan’s Dark Knight trilogy were really good films, it was one of the worst depictions of Batman ever So long and thanks for all the fish Rosebud was the name of Charles Foster Kane’s childhood sled I honestly don’t regret buying this calendar… but I wish I’d gotten it on sale. I can’t remember. Meh, it’s not like it’s the end of the world or anything. I don’t even think this can pass for chibi. This micro is a perfect example of LEGO not knowing when to say no. 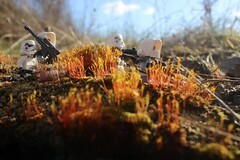 Some models don’t translate well into LEGO and some can be pulled of in a fairly reasonable resemblance, like the previous Infiltrators. The key to pulling off ships like this is plates, as few as possible to try and replicate the shape while keeping it slender and as in proportion as possible. Or, you can just stick a few blocks together in the right basic shape call in a Sith Infiltrator and laugh it up because we’ll buy whatever you throw at us. Hallelujah! See, that’s more like it. Rusty the Snowdroid here makes the craptastic models that make up nearly half of the micros in this calendar dang near forgivable! The inclusion of a base is a nice touch because it’s really not necessary, but it drives home the “snowman” aspect. I’ve always loved R2 (certainly not as much as some folks), but have never felt compelled to obtain all the different astromechs in LEGO form. Until now that is. I have no issue with the spacing of the top hat either, though I may or may not try to straighten that out later if it begins to bother me. Easily my favourite day of both Star Wars Advent Calendars thus far. They’re going to have to really pull out something phenomenal to top this! Santa Yoda was better, but at least now the Force is closer to being balanced and isn’t that what Life Day is all about? Maul’s a pretty popular guy right now, so I can see the appeal in giving him the starring role in this year’s calendar. If I can put in my order for next year now, how about a red Santa Vader building a Snow 3PO? Pretty sweet right? Or how about a Luke and Leia as elves building a Snow Vader? Either way, this year is now complete and it’s time to look to 2013 and all the good things the theme will (hopefully) have in store for us. First though, a quickie recap. What I liked: Sticking with generic figures and festive unique ones is the way to go and that snowman R2 is the belle of the ball imo. On the Micro side, offerings like the Naboo starfighter and Vulture droid are not only clever and well thought out, but make for a lot of swooshable fun for the young at heart (or hopelessly immature). What I didn’t like: Micros like the MTT, Sith Infiltrator and Nubian just didn’t cut the mustard and illustrate that there are just some vehicles that should be avoided at that scale. Verdict: I said at the begining to buy it and I stick by that. It’s a pretty good assortment of generic figs to build an army or entertain the younglings and the inclusion of a handful of stand out models and a couple great unique figs make it worth picking up on the sweet sales it saw before Christmas hit full swing. I can’t wait to get a new display case and begin to display my astromechs, just to see the snowdroid more often. I hope everyone has a fantastic Christmas and a great holiday season overall. See you next year!